I am more than satisfied with the quality and workmanship of the patriot bow tie, and I was pleased that it was customized to my request. My husband is delighted to be a member of the International Wooden Bow Tie Club. Thanks, Marvin, for helping me provide a truly memorable and unique Christmas gift. 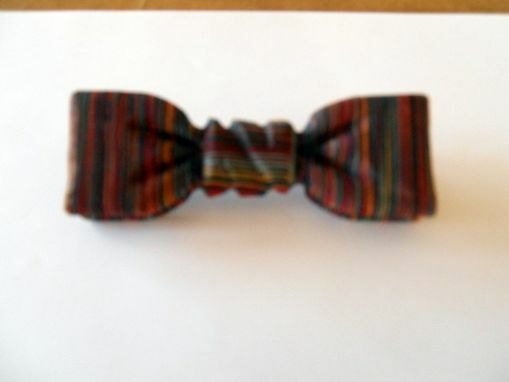 Classic Bow Tie, Colorply multi stripe tie red/navy/yellow/white. This wood bow tie is made from Colorply - sheets of very thin 1/16th of an inch wood - deep dyed and glued under extreme pressure - and manipulated to produce various colored bow ties. The colorful stripe approach creates a versatile bow tie that looks for all the world like fabric - with a difference!